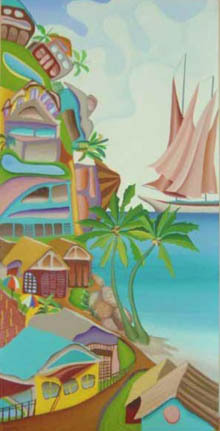 Yoshiko Kirby's Naive Painting Style Enhances Tropical Landscapes. Yoshiko Kirby's painting style developed alongside her acrylic painting techniques. The skills that Yoshiko learned during the development of her first substantial body of work were to hold her in good stead. These first landscapes, in a painting style that could be described as 'naive', were part of a series which explored the tropical area in which she was living. Simply titled 'I Live Here', the paintings used high key, happy colours and re-visited some of the feelings of wonderment that she had experienced as a child. One could perhaps say that, although a mature person, it was the 'child within' that was given the freedom of expression and encouragement to explore and experiment with her subject and materials. 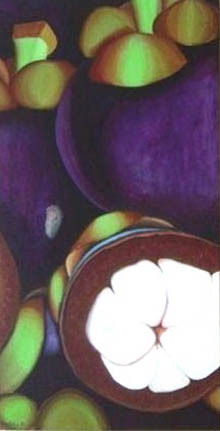 The acrylic painting techniques that she learned during this project were then further developed and applied in future, rather more conceptual works. See here. 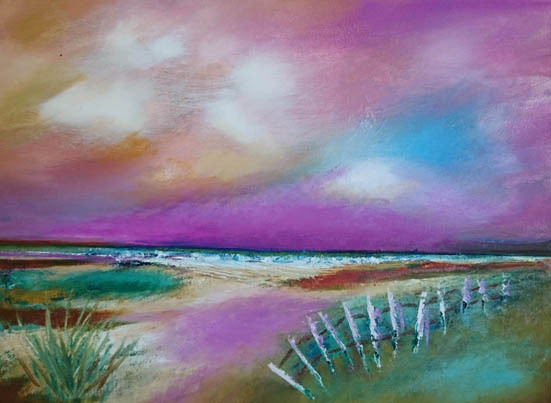 Held in conjunction with two other artists at The Tanks exhibition space in Cairns, Yoshiko's first serious foray into the world of exhibitions was wildly successful, with most of the paintings being sold. Some of the images from that series are displayed here. Yoshiko's interest in design and the repetition of nature's patterns are obvious as is her almost child-like use of areas of flat colour. She still enjoys working in this 'naive' painting style occasionally so if you would like to be informed of any new work please let us know via the form, below. An imaginary scene of the sun setting over the ocean inspired Yoshiko to investigate this loose painting style.